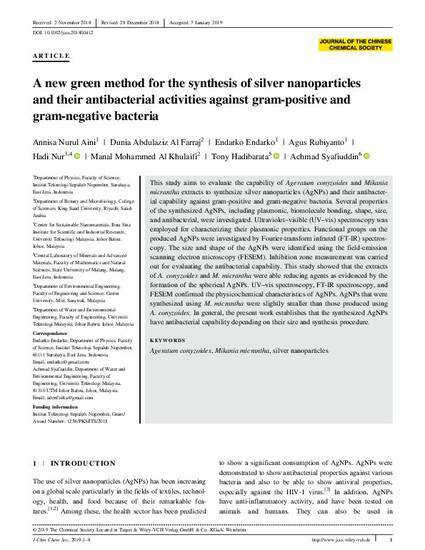 This study aims to evaluate the capability of Ageratum conyzoides and Mikania micrantha extracts to synthesize silver nanoparticles (AgNPs) and their antibacterial capability against gram-positive and gram-negative bacteria. Several properties of the synthesized AgNPs, including plasmonic, biomolecule bonding, shape, size, and antibacterial, were investigated. Ultraviolet–visible (UV–vis) spectroscopy was employed for characterizing their plasmonic properties. Functional groups on the produced AgNPs were investigated by Fourier-transform infrared (FT-IR) spectroscopy. The size and shape of the AgNPs were identified using the field-emission scanning electron microscopy (FESEM). Inhibition zone measurement was carried out for evaluating the antibacterial capability. This study showed that the extracts of A. conyzoides and M. micrantha were able reducing agents as evidenced by the formation of the spherical AgNPs. UV–vis spectroscopy, FT-IR spectroscopy, and FESEM confirmed the physicochemical characteristics of AgNPs. AgNPs that were synthesized using M. micrantha were slightly smaller than those produced using A. conyzoides. In general, the present work establishes that the synthesized AgNPs have antibacterial capability depending on their size and synthesis procedure.